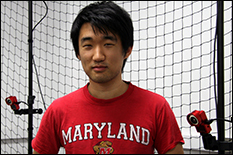 Eric Kim stands in the CPS & Cooperative Autonomy lab where he tests theories regarding cooperative robotics. Fourth year electrical engineering student, Eric Kim, was awarded a National Science Foundation (NSF) Graduate Research Fellowship. The Graduate Research Fellowship Program recognizes and supports outstanding graduate students in NSF-supported science, technology, engineering, and mathematics disciplines who are pursuing research-based master's and doctoral degrees at accredited US institutions. Kim, a double major in EE and physics, has been working on research in the electrical and computer engineering department under Professor Nuno Martins since his junior year. Martins heads the Distributed Decision Theory Group and the CPS & Cooperative Autonomy Laboratory. His interests are in control theory, estimation and information theory. Kim was invited by Professor Martins to take part in an Undergraduate Research Fellowship during his senior year. This inaugural ECE program was funded in part by the department and in part by the professor sponsoring the research. Professor Martins directed the efforts of Kim and fellow ECE senior, Nitay Ravin. Their final presentation was entitled, "Control Strategies for Cooperative Robots." This research, in addition to significant academic acheivements, garnered this NSF award for Kim. Kim will continue his studies at the University of California, Berkley focusing on the interface between controls and computer science. He would like to participate in research that allows engineers to understand the decision-making processes for autonomous systems. Kim also wants to explore controls laws for components in networked systems, which will inspire global behavior and help ensure stability. He is also interested in generating controllers from high-level specifications—making it easier to develop intelligent systems without knowledge of control math. At this time, Kim is still undecided about pursuing a career in academia or industry.